As you may know, I’ve got a bub on the way! I’ll be taking maternity leave in 2019 and I’m no longer taking new clients. I’ll be back coaching in the second half of 2019 with brand new programs to deliver the most powerful coaching experience possible - if you’d like to be the first to know when I open up the limited spaces, just enter your details below! You've read all the books and blogs and listened to so many podcasts that you're feeling a little overwhelmed and unsure of how to implement everything you've learned. You start new healthy habits with the best intentions but run out of motivation or willpower to make lasting changes. You're ready to get out of your rut, but you're not entirely clear on what's holding you back or keeping you stuck. You're feeling excited about a new path unfolding but at the same time you're feeling isolated and craving support and understanding. You're ready to ignite your passion, find your motivation and purpose and say 'heck yes!' to living and extraordinary life. You're ready to tame that nasty inner critic and give self doubt and negativity the boot. If you can relate, beautiful, you are not alone! 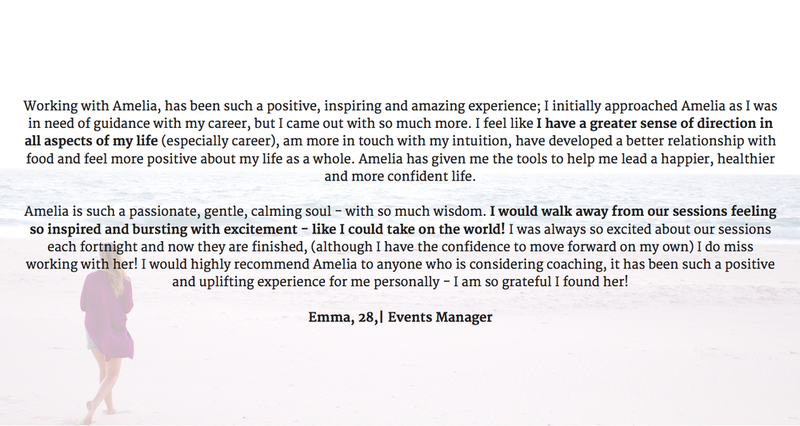 These are the struggles I've heard from the over 400 women I've worked with - and each of them has overcome their personal hurdles to find a deep sense of empowerment, peace, and purpose. As your coach, I will work with you to ensure that the challenges you're facing make you stronger and become vehicles for deep diving soul growth. I know that living a purposeful, inspiring, and radiant life is what you're here to do and if you're reading this, it's clear that you're ready to uncover what's holding you back and step into your brilliance. 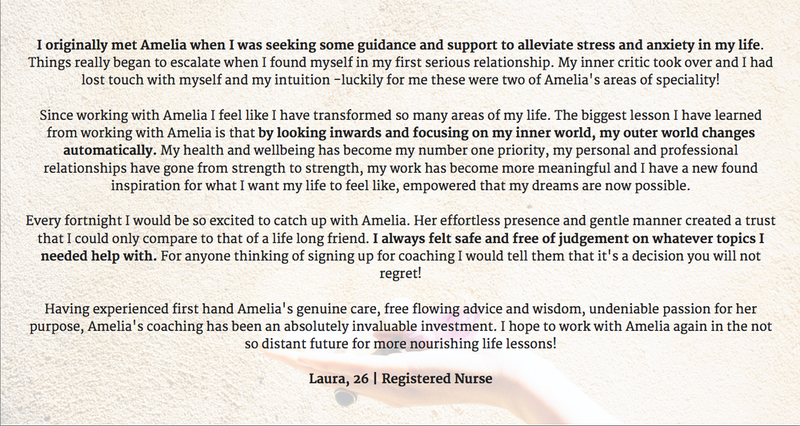 As a coach, I combine my Honours degree in Psychology, ACT Therapy training, Mindfulness Therapy training and wellness coaching qualification with intuitive and energetic healing techniques. I've personally mentored with coaches, healers and meditation teachers from Australia, Bali, India, and the U.S. I'm a big believer that shifting on every level - energetic, emotional, mental, and physical - is what brings about true lasting change. We're all on unique paths - that's why I'll provide you with individually tailored practical, emotional, and spiritual tools that work for you and your lifestyle. What you won't find in my programs: a 'one size fits all approach' or surface level solutions. My coaching program is a dive deep into letting go of what no longer serves you. You'll tame the inner critic, connect with your best self and make your dreams happen. Are you ready to get started or need some questions answered? All sessions are via Skype or phone. If you haven't had much experience with Skype, drop me a line and I'll help you set it up - we can even do a test chat if you'd like to get a feel for Skype sessions.